President Buhari urge Nigerians to keep faith with the ruling party – Royal Times of Nigeria. 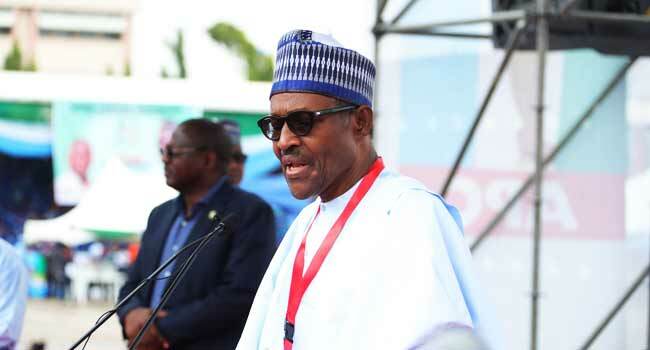 President Muhammadu Buhari has described the adoption of consensus as a first option for the Saturday’s national convention of the All Progressives Congress as commendable, saying the process led to a lot of healing and cohesion across the states and the zones. Speaking at the party’s national convention held at Eagle Square in Abuja, President Buhari assured that despite a few lingering issues with the congresses in some states, the party will emerge stronger after the convention. According to him ,the unresolved cases the party has are the price that has to be paid for success as everyone wants to be associated with a winning team. He therefore urged members of the ruling All Progressives Congress (APC) to keep faith with the party as it address lingering issues following the just concluded congresses at various levels. Meanwhile, a Former Edo State Governor Adams Oshiomole has been announced as the national leader of the ruling party All Progessives Congress (APC). Mr Oshiomole emerged as the sole candidate for the position, after delegates affirmed to it. The former Edo Governor and one time labour leader was one of the 18 candidates affirmed unopposed by delegates at the national convention of the party in Abuja on Saturday.